"We invite you to relax in our part of Hill Country Heaven. This private and peaceful river house is nestled among the trees, on the majestic Guadalupe River, just 15 miles west of Kerrville, near Hunt, Texas. The original stone cottage, perched up on a small cliff, was built in 1935 and renovated in the winter of 2000. The large living area with cathedral ceiling and cozy fireplace is surrounded by treetops and hills with views of the river. 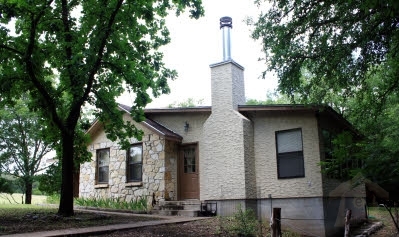 Open year around, and sleeping up to 6 people in comfort, you will have all the modern conveniences necessary for a stress-free Hill Country vacation". Moseying - Hill Country Style. The Riverhouse is available year around with a 2 night minimum. 3 night minimum on holiday weekends. A 50% deposit is due upon registration by phone or online. Personal check, cash, MasterCard and Visa are accepted. No smoking in the River House. Check in: 2:00 PM, Check out: 11:00 AM. If you cancel your reservation 45 days or more prior to arrival, we will refund all but 25% of your deposit. If you cancel in less than 45 days, there will be no refund. Deposit can only be applied to dates reserved. If you come late or leave before scheduled departure date, you will be charged the full amount for time reserved. No shows will be charged the total reservation amount. Reservations made 8 to 12 months in advance require a $50.00 per night non refundable deposit to cancel.